To say that life can get stressful and at times difficult to handle, is pretty much an understatement, right? If your days are like mine, then they are jam-packed, hectic and non-stop. There’s getting the kids and yourself out the door on-time in the morning, then working hard all day, planning healthy meals, doing activities for the kids after school, working on our side hustle business once the house is finally quiet well into the late night…then there are unexpected things like our kid gets sick, or we have an unexpected deadline at the same time as a launch, or our partner needs to go out of town leaving us to manage everything on our own…..it’s not a wonder we push ourselves into the brink of burnout. The problem is that the constant stress can really affect us negatively in so many ways. However, with a little understanding about managing stress and how it affects your body, your stressors can be easier to manage and, oftentimes, preventable. Your body goes through a series of hormonal changes during times of stress. The insulin in your body becomes off-balance, as well as the levels of cortisol and adrenaline, which in turn can cause a rapid heart rate as well as an increase in your blood pressure. Some other side effects of stress are bloating, hair loss, and difficulty losing weight. Yikes, right? The general key is to practice self-care. I talk about the importance of self-care all the time, but that’s because a lot of stressors in our life can be eliminated or decreased by following a simple routine that puts our health and wellness first. Eating nourishing and nutritious food is one of the most important things we can do not only to ease stress but to balance the hormones in our body and ensure our body is receiving the adequate amount of nutrients, daily. Find ways to relax after a tough day. Rather than turning on the television or decompressing with Netflix and your iPad, head outside for an evening walk (take your family out with you!). If the weather is unappealing for a walk outside or it will add to your stress due to the pollution and noise (that’s the case for me in Jakarta! ), then try a gentle yoga workout indoors. A hobby such as adult colouring is a great way to relax and actively meditate while releasing the tension in your body. Also get into the habit of doing meditation for 10-15 minutes every day to notice a shift in how you feel mentally. If you want even more ideas for ways to practice self-care, download my free guide which you can access here. Oftentimes, our bodies are missing key nutrients that can cause minor hormone imbalances. However, after combining a few vitamin deficiencies with added stressors that are going on in your life, your body can totally break down and your stress can becomes an even bigger problem- hello adrenal fatigue! Good quality vitamin supplements and probiotics are an excellent way to combat the effects of stress, and go hand-in-hand with a wholefood diet. Sleep deprivation is a leading cause of excessive stress in our day-to-day life. The average adult should get between 7 and 9 hours of sleep per night. If you are barely getting by with enough shut-eye, your body is working twice as hard, and your stressors are far more amplified. It’s important to set up a nightly bedtime routine that you actually stick to as top priority- enjoy some chamomile or valerian root tea, avoid screen time 30 minutes before you sleep, enjoy a nice bath, diffuse essential oils and aim to be in bed with enough time to get at least 7 hours of rest. This really is a something that needs to become a non-negotiable- even if you are super busy. You will be more productive, happier and feeling more on top of things when you get enough good quality rest. Whilst these are the top four ways to minimise stress in your life, I have many more healthy habits I’d like to share with you in this special PDF Guide "12 Healthy Habits For Busy Women Entrepreneurs". Enter your details below to grab your own free copy. Otfen we can get overwhelmed when we try and do everything on our own. Never be afraid to reach out and get support, and don’t feel guilty accepting help from others. 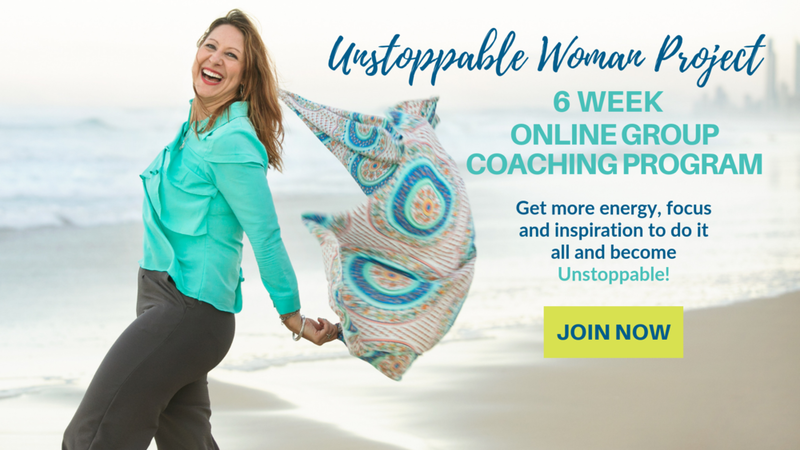 My group coaching program The Unstoppable Woman Project is a great way to get extra support and to put an end to potential burnout. With these simple yet effective changes to your lifestyle, the way your body processes and handles stress will be far less challenging and less damaging to your overall health and wellness so that you can be on top if your game in all aspects of your life.